The early days of the settlement called Paugassett were full of hardship. So discouraging were its prospects that, in 1659, nearly five years after the first settlement, the General Court ordered that the place "should be deserted with reference to settled habitation" within one year, unless its prospects improved. Every town in those days was built around the "Meetinghouse," and the fitness of the settlement to become a town was measured by its "capacity to mayntayne an orthodox minister." The Court had established that at least thirty families would be necessary, and since there were fewer than ten families in the settlement here, every application for town organization the inhabitants made met with refusal for 20 years. During that time the settlers made the trek to worship in Milford, a day's journey away. It was not until May 13, 1675, that the town of Derby was finally incorporated. There were still only twelve families in residence, but they assured the Court that there were eleven more families on the way, and that they had already secured the services of the Reverend John Bowers, who had agreed in 1671 to move to this settlement. The General Court gave as chief among the reasons why the act of incorporation was finally granted the fact that the people had engaged Rev. Bowers, and expended about "one hundred pownes" in preparing his house. For the next eight years, the congregation met for worship either in the parsonage or in one another's homes, and it was not until 1681 that the town voted to build a Meetinghouse. This very plain building was located at Squabble Hole ( Google this for some fascinating information!) more than a mile to the northeast of the present one (in what is now Ansonia). In 1721 the town voted to sell the old church and build a new one on "The Common," the little green between Academy Hill Rd. and Clark St. This second Meetinghouse served its purpose for 100 years. It was here that the Rev. Daniel Humphreys preached for 54 years, while his son, who was to become Gen. George Washington's aide and most trusted general, grew up. And Isaac Hull, the famous wartime Commandant of the USS Constitution was baptized. The town would not assume responsibility for the building of a third Meetinghouse, so the members of the congregation undertook their first Building Fund drive. The money was soon raised, but the members found themselves embroiled in the first major controversy in the congregation's history. The problem was one of site selection, and it arose because of the fact that during the century from 1720 - 1820, the area known as "Derby Narrows (East Derby) had grown until it had a larger population than "Uptown," near the Common. 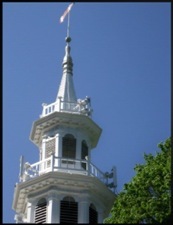 Although several prominent families withdrew their memberships, the present site was approved and the sanctuary was built by Williams and Barnum of Brookfield, at a cost of $525. Some say it follows the plans of Sir Christopher Wren, the noted architect. In later years the Fellowship Hall was added, then the Chapel, and two classrooms above it. Over the 335 years of its existence, the people of this church have faced challenges and new opportunities for service, and we look to the future with our feet firmly planted in the past, confident that the God who led our spiritual ancestors to this place when it was still barren wilderness, will guide us onward as we seek to do God's will in the years to come.